Wear and tear osteoarthritis of the low back, or lumbar spondylosis, causes slightly different signs and symptoms than osteoarthritis occurring in the neck. This variation of complaints and problems is due to the difference in anatomy of the low back and pelvis that are so much larger, heavier and stronger than in the neck and other parts of the spine. By comparison there is much less spur formation, disc thinning and alteration of the spinal curves in the low back than the neck. Symptoms often begin slowly and increase gradually with time, but can also worsen suddenly. Pain ranges from mild to severe, superficial or deep, in a small local area or widespread to the low back, pelvis and legs down to the feet, ranging from a small annoyance to debilitating pain. Most often spondylosis or spinal osteoarthritis is a common result of the aging process most adults experience over time; it is due to age-related spinal degeneration that tends to affect all areas and parts of the spinal vertebra based on what parts of the spine received most stress and injury during the lifetime. 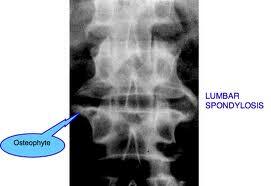 Bones spurs or osteophytes are a common finding in spondylosis occurring at any area of the spine, such as the lumbar spondylosis shown at the right. when a repeated heavy or prolonged work load is applied to the spine very early in life while the spinal structure is not completely developed and therefore more vulnerable to small repetitive injury. Examples of this would be in young girls who participate at a very high level of ballet, gymnastics or horseback riding, or young boys who do heavy farm or construction work, or play football or basketball; all of these apply a lot more spinal stress than is imagined at the time. Over time the discs and joints of the spine deteriorate at a faster rate because of the early start provided by the early wear and tear process that will eventually become lumbar spondylosis or degenerative osteoarthritis. Treatment of spinal osteoarthritis is usually conservative from a medical standpoint because there is not much that can or should be attempted to reverse the aging process of the spine; the bony joint and soft tissue changes are too broad and too deep within the spine for specific effective medical treatment. Manual therapy as a spondylosis treatment often provides relief of pain and other symptoms of spondylosis, like spinal traction, exercise, chiropractic manipulation, physical therapy sessions to restore lost range of motion, improve posture of the involved area and core muscle strengthening. None of these should be thought of as a cure, since the degenerative changes tend to be permanent, although any or all of them can provide great relief that can last a long time until once again aggravated by the exigencies of life. OTC and prescription medications are sometimes used, although they can have a reverse impact to actually make spondylosis worse by reducing an awareness of pain and so the individual will do more things to harm the body because of not feeling a pain signal to stop. Ignorance is not bliss. Surgery is occasionally performed with mixed results because of the nature of the tissue in proximity to sensitive nerve structures. There are many easy and safe measures to take that will reduce the intensity and frequency of bouts of spinal pain related to spondylosis. 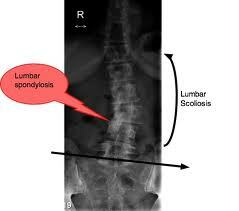 Learn about them at spondylosis treatment.